SINGAPORE - In celebration of the 20th anniversary of diplomatic relations between Singapore and China, a dedicated marker to commemorate late Chinese leader Deng Xiaoping was unveiled here on Sunday. The marker, which sits beside the Singapore River, was unveiled by Singapore Minister Mentor Lee Kuan Yew and Chinese Vice-President Xi Jinping, who is here on a three-day official visit. 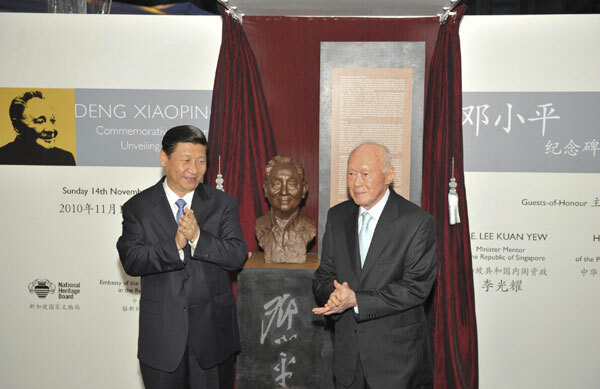 The marker comprises a text panel and a bronze bust of Deng commissioned by the Chinese Embassy to Singapore. It also features Deng's signature etched below the bust, and a famous quote by Deng, "Development is of overriding importance," inscribed at the back of the marker. The marker sets in stone the accomplishments of this visionary - detailing Deng's early life, political activities, his visit to Singapore in 1978, and his role in Singapore-China relations. Deng was the first senior Chinese leader to visit Singapore. His visit in 1978 spurred subsequent interactions in various fields between the two countries. Two Chinese farmers who became an overnight sensation when their heart-rending version of a famous pop song appeared on the Internet took to the stage in front of thousands of fans in Shanghai. The world's largest food company added Nescafe Yunnan Arabica coffee to its beverage portfolio. We are in the same world , eat the same thing from god ,how can we part ourselves from one to one?